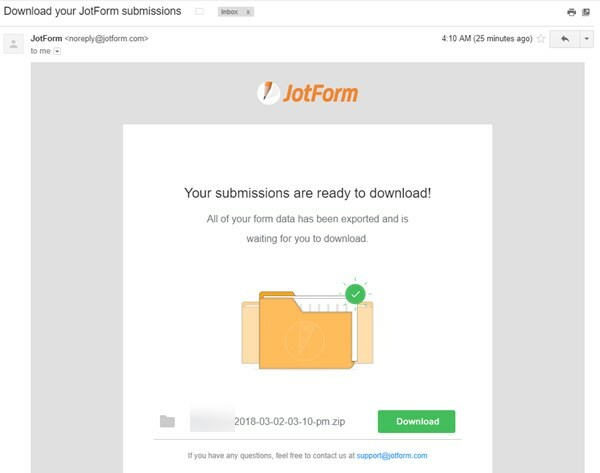 JotForm allows you to create a file upload form. Now how do we fully or partially download these files? 1. Go to your MY FORMS page, select the form and click SUBMISSIONS. 2. When you scroll down below, you'll see the DOWNLOAD ALL UPLOADS button just above the grid list. 3. After you clicked the button, a message box should appear that says an email will be sent to you when the data is ready for download. Check your email afterward, it should be almost instant. However, if the file is huge, it would take a few minutes. 1. On your Submissions Page, click the GEAR icon. 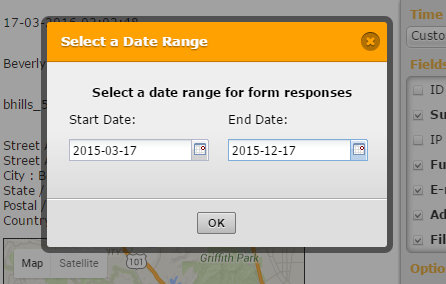 Select a TIME FRAME then choose the date range you want. Or you can set a CUSTOM TIME FRAME. 2. If you choose a CUSTOM TIME FRAME, you'll see a pop-up window asking you for the start and end date of the submissions you received. 3. 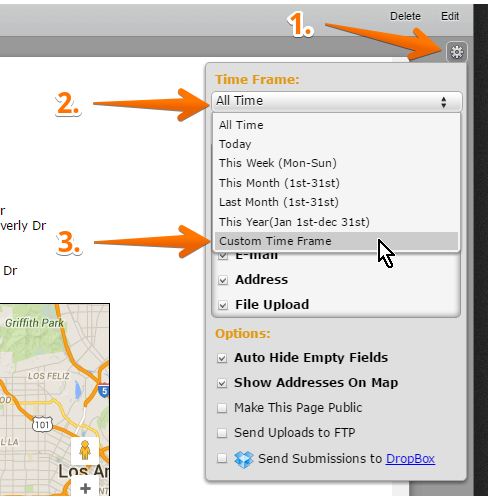 You'll see the grid list showing specific submissions based on the date range you selected. You will also now see a DOWNLOAD UPLOADS IN TIME RANGE. IMPORTANT: The system has a download limit of 250 files or 250 MB in total size. This is where you will need to make partial downloads or per batch. You now have a copy of your file uploads in a compressed zip file on your local storage. Do you have any questions? Feel free to leave a comment below. I do not have the option to download all uploads. I have requested the files twice now with no success. I am looking to download from the senior ad submissions. Is there any way of being able to download the attached file on a form submission other than via my forms? I have setup a form so that certain email addresses receive it but I tested this out and via email, I cannot download the form when I read the email. Is the only way to download it, via my forms and logging in to download it? Is there a way to change the filename of the download folder to include a field from the form. We are collecting images from users and would like to have the folder name include the user's name which we collected earlier in the form? I am not receiving the emails with the submissions in .zip format. 1) I've tried "Download All Uploads" - no success...I tried a different time frame - month, a week even a day - no success. 2) I tried changing my email. I receive the email message to "verify" my new address just fine, but when I go in to "Download All Uploads" nothing happens. I am using a widget to take photos as part of a form. When I downloaded the results from the the form using Excel or CSV, i get an address of where the photo is located instead of the actual photo. Is it possible for the download to contain the photo instead of an address as to where the photo is located? If not inside Excel or CSV, is there another data management software that will allow the insertion of photos into the download? Help! I have done the Download All Uploads (twice) but haven't received any email telling me where the files are. When any of the assigned sub-users attempt to follow the procedure for "Downloading All Uploads” they get an alert, "You are sub-user of the form, therefore you are not allowed to make this request." – how can I edit their permissions to enable all the co-users to do this at the same time they is also retrieving all the form submissions? The download all submissions button isn't appearing, I have multiple files uploaded with all the forms that have been submitted, how do I download the uploaded files? In my form I am asking the person filling it out to upload a photo. When I download the photos that have been uploaded, it's hard to tell which photo goes with which submission. I can individually look at each one and match it to the photo shown on the submissions page, but this will take some time. Is there an easier way to track which submission each upload comes from? Thanks! Is there a way that someone can get a download of the submission files in Excel format sent to their email automatically everyday? I am not getting a prompt to save the file when i ask to download all files? Is there a way to download specific uploads? For example, each form has 2 upload buttons for 2 different files; can I download all of one upload to a folder? or must I download all uploads all the time? Can I create a form that facilitates a PDF download?